How to Make an Awesome Death Star Piñata #makereducation « Adafruit Industries – Makers, hackers, artists, designers and engineers! MAKE posted about this incredible Death Star Piñata project that we envision as the perfect centerpiece to any end of the year classroom party. 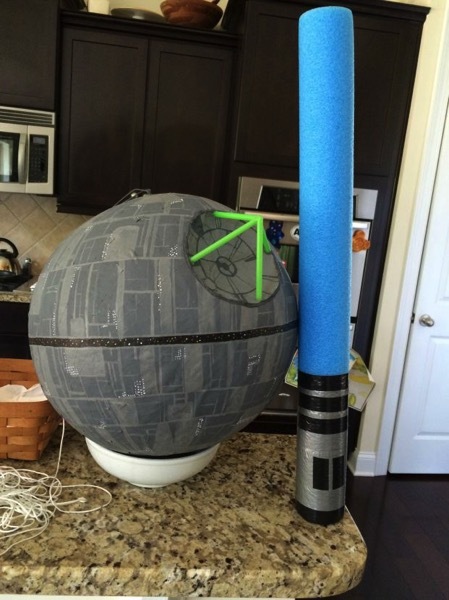 This Death Star piñata is actually rather simple to build, using only a beach ball, strips of newspaper and paper mache glue mix. The patience comes in carefully painting all of the Death Star surface details after the mache ball is finished and primed with gray spray paint. A graduated series of cardboard disks were used for the string holder inside the paper ball to better distribute some of the the weight and stress to make the piñata last longer.